red edged clear white, the edging tending to disappear on late blooms and on young plants; cylindrical stamen cluster, white filaments; leaves dark green, long-lanceolate, apex tapering acuminate, gently wavy, margins serrate, venation somewhat raised. Discovered in the wild by Tomokazu Fujita in 1947 in Tama-no-ura, Fuku'e Island, Gotô Archipelago, Nagasaki Prefecture, Japan, and selected by Konomi, Masahiro, Kurume City, Fuku'oka Prefecture. 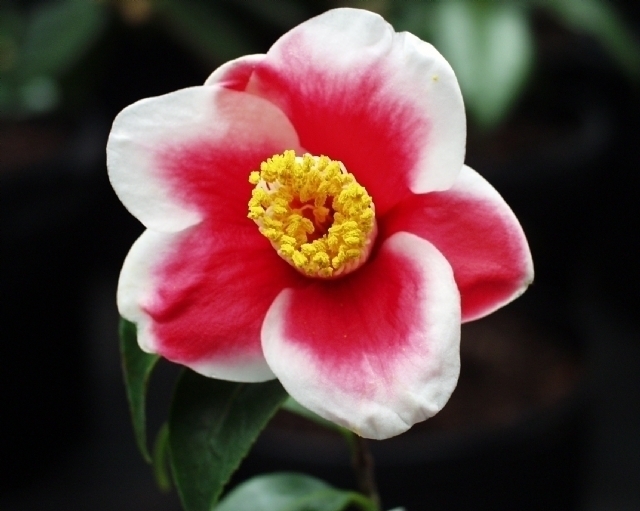 Named and released by Prefectural Camellia Society. First exhibited in Nagasaki in 1973. First introduced to the West by Nuccio's Nursery, 1979.